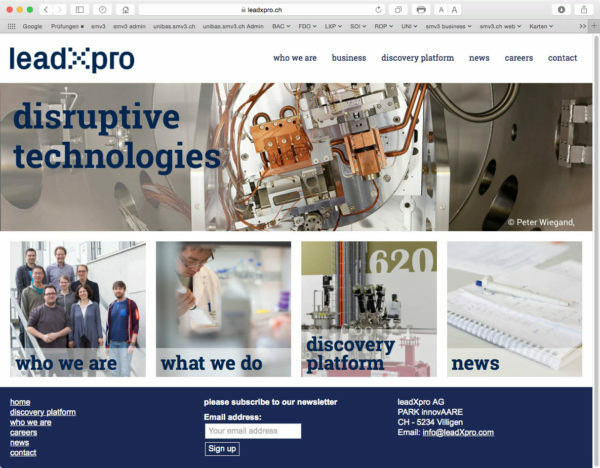 leadXpro is a biotech startup founded in 2015. Its business model is the development of drugs against so far untractable transmembrane targets using the large research facilities of the Paul Scherrer Institute and other biophysical methods. It pursues some own projects and others in partnership with industry and develops very successfully – read more about it in leadXpro’s news section. The original, still minimalistic web site should be replaced by a somewhat more stylish, but not exaggeratedly animated design which should clearly emphasize the uniqueness and the partnership business model of the company and observe the corporate design rules. It is targeted at investors as well as potential partners and should therefore not appear too technical. I drafted a ‘window’ design, in which either one big picture can be divided or smaller picture can reflect the topics (see top picture). On the top, a large slider shows changing pictures with slogans. Below, the typical topics read from left to right like a sentence “who does what, and how, and what are the results”. Clicking on the topic pictures should open a text box beneath the window with the content. The layout is especially useful for mobile devices, where the pictures show up one above the next instead from left to right. The IT company Teleinformatik in Zurich implemented the idea on the basis of WordPress and produced a very easy to use backend for the administrator where all the contents can be managed without any programming. More about it in Teleinformatik’s blog. 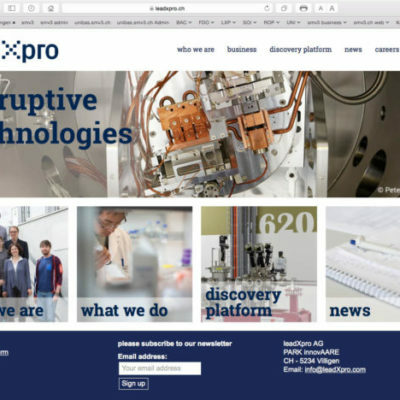 I would like to thank all leadXpro colleagues for their patience when I took pictures, and Linda Zeller and Reto Küpfer from Teleinformatik for their excellent collaboration.